Welcome to the QMENTA SDK’s documentation! Feel free to contact us if you have any doubt or request at sdk@qmenta.com! We are happy to hear from you and expand the capabilities of the platform to fit new useful requirements. The QMENTA platform provides a unified solution for data management, processing and visualisation. The analysis (neuroimaging tools) are executed on the hybrid cloud infrastructure as Docker containers and treated as black boxes that communicate with the platform using our SDK. 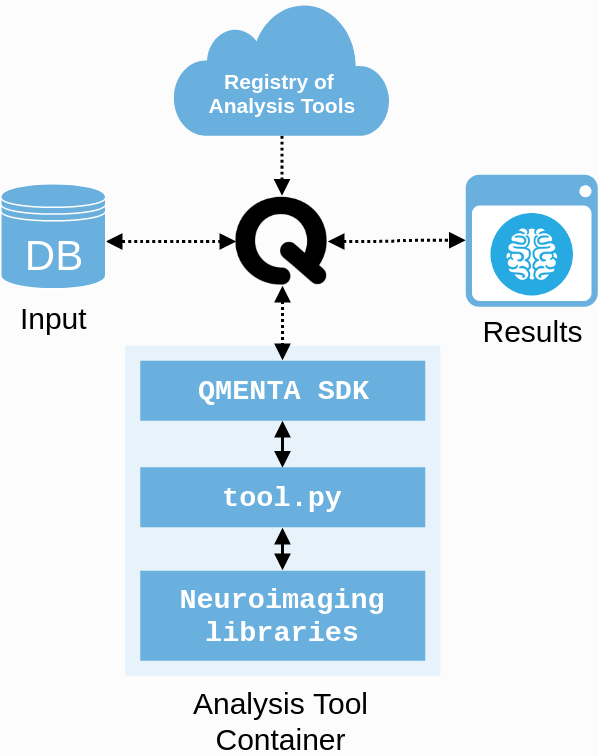 A simple Python script connects the QMENTA platform with any third-party program. This typically involves fetching the input data, starting the binaries or scripts and uploading the result files in a compartmentalized, traceable and secure computing environment. Any data uploaded to the platform can be used for analysis with a simple step, and the resulting files can be managed and visualized within the same platform website. In addition, tools can also be seamlessly customized to include external parameters using GUI elements that provide an easy way for users to choose between different options and tune the execution flow of the analyses. We invite you to start with this short tutorial which covers the basic topics of how to integrate your tools step-by-step. In order to add tools to the QMENTA platform you need to have developer privileges. If you are interested in this feature, please contact us at info@qmenta.com.